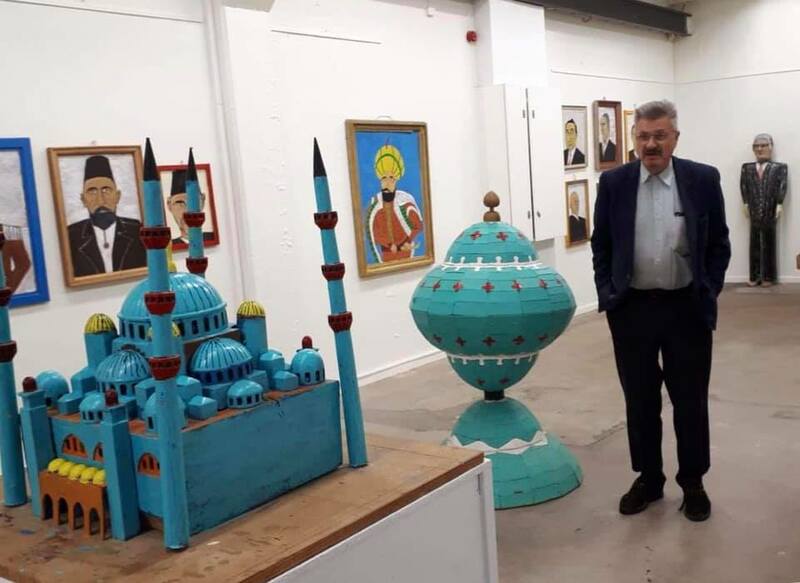 Already as a young man Jan-Erik Svennberg (born december 13, 1944) from the city of Sala in Sweden, became interested in the culture of Turkey. During his service in the army he taught himself some Turkish by means of Swedish-Turkish dictionary. When he was around age thirty he began making his first small wooden replicas of Turkish buildings. The event that would influence his life happened in 1979 when he made a group trip to Bulgar. He then could make a three-day trip to Istanbul and although he was a bit confused by the bustle of the city, he became fascinated by it's atmosphere. He especially was impressed by the mosques he had visited. Beginning around 1979, Svennberg meanwhile has made some twenty models of different sizes, which he all displayed in the garden around the house. Apart from making these creations, Svennberg also was interested in various aspects of Turkish cultural life, reading stories about Turkish history and about famous Turkish personalities, which he also depicted in paintings, as the picture below shows. Around 2010, when Svennberg had reached his mid sixties, he stopped to make constructions. After his parents had passed away, he lived alone in the parental home, taking care of his creations and meeting visitors from various countries around the world. They are welcome on appointment. In Sweden people know about Svennberg's work, also because in 2007 he appeared in the popular television series 100 höjdare (100 highlights), 2004-2008. Svennberg's passion for mosques is architecturally and aesthetically inspired and has no relation whatever with the public debate in European countries about Islam in western society. 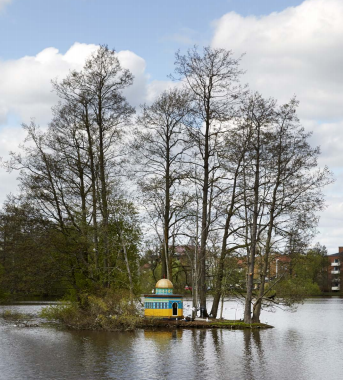 In april 2013 on a small island in Sala's city park a model of the Rock Mosque in Jerusalem made by Svennberg, was unveiled. In august 2013 this replica was fully destroyed by a probably deliberately caused fire. 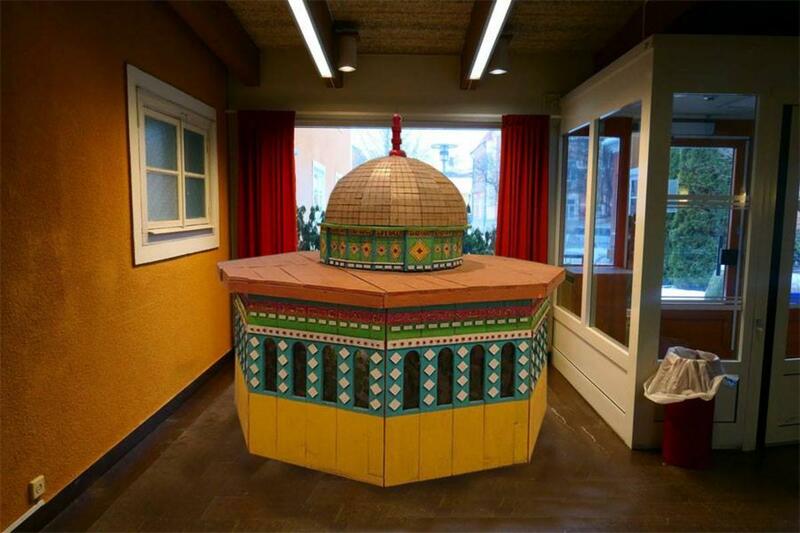 As reported by a local journal, around the turn of the year 2017/2018, the municipality of Sala bought a new replica of the Rock Mosque that Svennberg had made. It was exposed in the summer of 2018, but then it was stored in a depot. The group Lilla Istanbul Friends hopes that the municipality soon will find a safe indoor location where the public can see it. From December 1, 2018 until January 12, 2019 the Aguéli Museet in Sala presented Svennberg's artwork, including a number of his paintings of well known Turkish personalities. * Svennberg's work was featured, together with creations of other Nordic self-taught artists, in an exposition Annan Konst (Other Art), which in 2009 and 2010 traveled through Sweden, Norway and Finland. Hey Henk, hope all is well in Holland... I wonder if the insides of these models are as detailed as the outsides ? What incredible patience it must take to design and then build one of these... I wonder how long each model takes from start to finish ? Another great post Henk. Certainly many people may assume its a Svennberg´s statement of religious affiliation, when, as it is clear for those free of political approaches, inspiration came after an unforgetable experience. According to swedish doctors, here we have a case of "Asperger syndrome" ( a rubbish for me, what a terrible disease imagination is)Svenska dagbladet wrote a whole article focusing more in facts like these, rather than in the tecnique, inner motivations, etc. Certainly his wonderful art doesn´t need a media camapaign, neither his mental condition to be made a fetiche. (Van Gogh quickly comes to my mind)"It´s a terrifying world", Mr. Svennberg said in that same interview, "I like nothing but to wake up early and read a little on Turkish history, Russian revolution and World War I and so, later to work in my art" What a lucky man Mr Svennberg is. Hi Henk, A couple of months back I made a little hitch hiking trip over to this from Stockholm. It was wonderful. The constructions are much bigger than they seem. I crawled inside the main one (the blue) and stood up in there. It was designed inside too. He's a lovely man and really likes having visitors and showing them, proudly showing me his visitor book and naming the countries. He has also a little art gallery and is clearly an accomplished painter. I have lots of photos if you'd like to see them Henk. All the best, Simon.